Mollie Steimer was born in Russia on the 21st of November, 1897 (where her birth name was Marthe Alperine). Her family emigrated to America, settling in New York City, when she was fifteen years old. Steimer was a factory worker in New York's garment industry. She began to read books on trade-unions and became an activist. Taking her activism a step farther, in 1917 Mollie joined a group of Jewish anarchists who called themselves the Frayhayt. She shared living space with her colleagues (at 5 East 104th Street in Harlem), attended their meetings and became vocal about the group's beliefs (such as their opposition to America's involvement in World War I). In the summer of 1918, six members of the Frayhayt (including Steimer) were arrested for publishing materials which the U.S. federal government claimed undermined America's war effort. Mollie was found guilty and was sentenced to fifteen years imprisonment. After her appeal was denied, Mollie was deported to Russia. She arrived in Moscow on December 15, 1921. The new Bolshevik government did not approve of anarchists and, on the 1st of November, 1922, Steimer and her partner (Senya Fleshin) were arrested. They were charged with aiding criminal elements in Russia. Although she was sentenced to serve two years in Siberia, Mollie escaped and returned to Moscow. She was arrested again and deported again—this time to Germany where she and Senya Fleshin opened a photography studio. The pair fled to Paris after Hitler came to power. 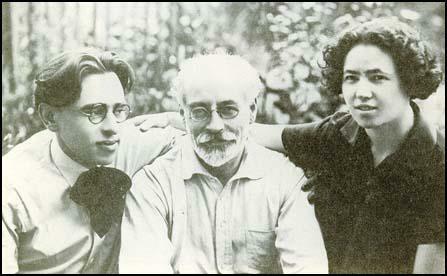 This image depicts Senya (on the left), Mollie (on the right) and Vsevolod Volin (in the middle) in 1926 (while they were in Paris). No longer safe in France, after it fell to Hitler's control, Steimer and Fleshin moved to Mexico where they opened another photo studio. Steimer died there—in the town of Cuernava—on July 23, 1980. Bos, Carole "Mollie Steimer - Photo and Brief Bio" AwesomeStories.com. Oct 07, 2013. Apr 18, 2019.